, sieur d'Ablancourt, a scholar of considerable parts, and once admired for his translations from ancient authors, was born at Chalons, April 5, 1606. He sprung from a family which had been illustrious in the law, and the greatest care was bestowed on his education. His father, Paul Perrot de la Sailer, who was a protestant, and also a man learning, sent him to pursue his studies in the college of Sedan; where he made so rapid a progress, that, at thirteen, he had gone through the classics. He was then taken home, and placed for some time under a private tutor, after which he was sent to Paris, where he studied the law five or six months, and was, when only in his eighteenth year, admitted advocate of parliament but did not adhere longto the bar. 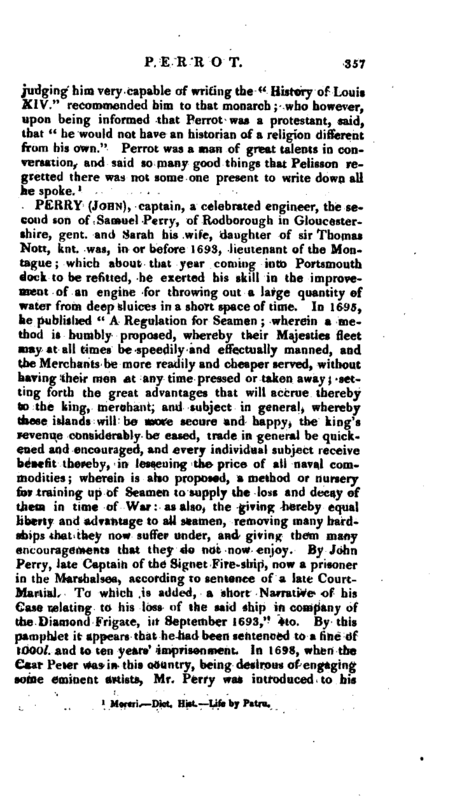 Another change he made about this time of great importance, was that of his religion, for popery, of which he embraced the tenets at the persuasion of his uncle Cyprian Perrot, who, in hopes of procuring him some valuable benefices, took great pains to recommend the church as a profession, but in vain. 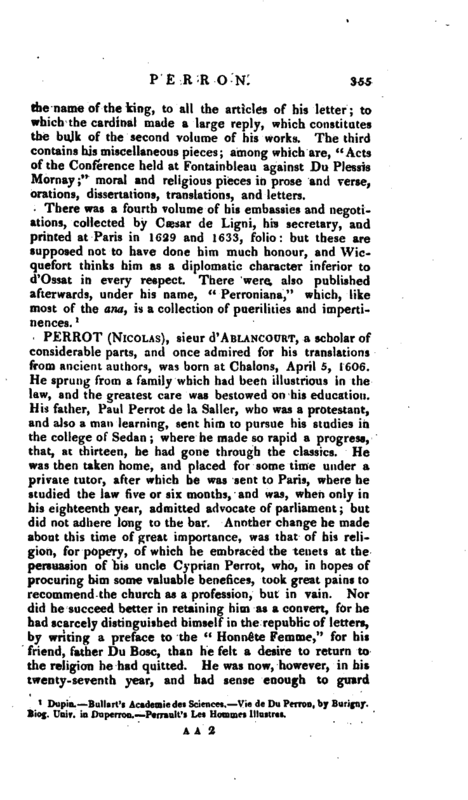 Nor did he succeed better in retaining him as a convert, for fte had scarcely distinguished himself in the republic of letters, by writing a preface to the “HonneXe Femme,” for his friend, father Du Bosc, than he felt a desire to return to the religion he had quitted. He was now, however, in his twenty-seventh year, and had sense enough to guard | against precipitation in a matter of so much consequence. He studied, therefore, the differences betwixt the Romish and reformed church, and after three years’ investigation, during which he did not disclose his intention to any one, he set out from Paris to Champagne, where he abjured popery; and very soon after went to Holland, till the clamour which followed this step was over. He was near a year in Leyden, where he learned Hebrew, and contracted a friendship with Salmasius. From Holland he went to England; then returned to Paris; and, after passing some weeks with M. Patru, took an apartment near the Luxembourg. 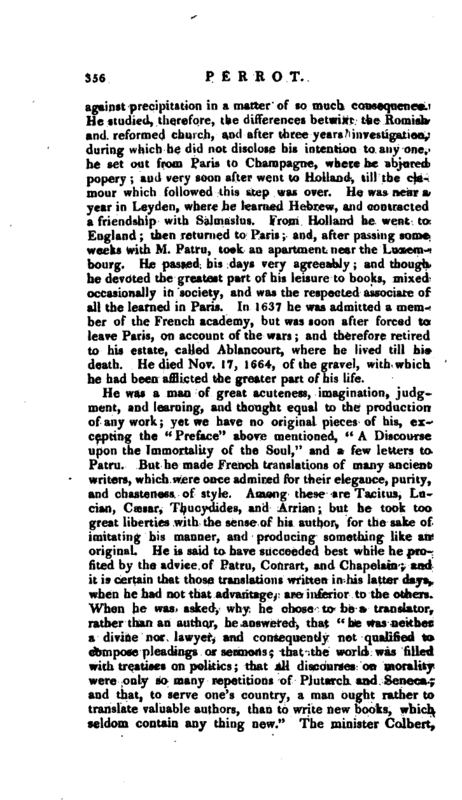 He passed his days very agreeably; and though he devoted the greatest part of his leisure to books, mixed occasionally in society, and was the respected associate of all the learned in Paris. In 1637 he was admitted a member of the French academy, but was soon after forced to leave Paris, on account of the wars; and therefore retired to his estate, called Ablancourt, where he lived till his death. He died Nov. 17, 1664, of the gravel, with which he had been afflicted the greater part of his life.